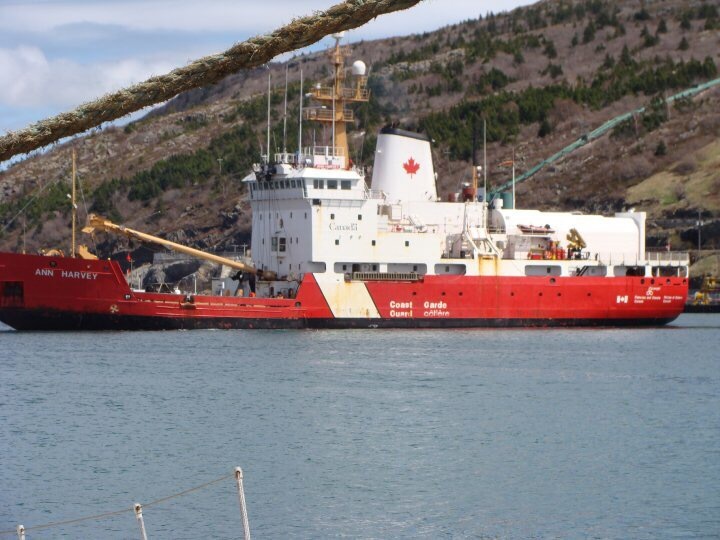 The CCGS Ann Harvey is a common sight in the St. John's harbour. Her namesake was a young girl from Isle six Morts in Newfoundland who, along with her father, rescued the passengers and crew of two different vessels in distress in the early 1800s. The ship herself was built in Halifax, NS in 1987 by Halifax Dartmouth Industries. Ann Harvey doing drills in St. John's Harbour. Photo by Heather Elliott. The 27-year-old vessel is outfitted for multiple tasks, depending on the nature of the assignment. She is a buoy tender, SAR vessel, and light icebreaker. She can also provide fishery enforcement , provide response to environmental emergencies, and assist with marine navigation service. On board, she has a hangar for two helicopters, and the capacity to carry 17 tonnes of helicopter fuel. She also carries a six metre fast rescue craft, and a self propelled barge with its own launching mechanism. The barge helps the crew reach and reset buoys that are too close to shore for the ship to approach. With a range of 8,200 nautical miles (15,200km) she's excellent for both at sea and coastal work. She always has between 24 and 26 coast guard crew assigned to her, with 4 cadets on board for training. Of those crew members, one is always a rescue specialist. The on board personnel are divided into three different departments; Officers, Engine, and Deck. She returns to St. John's for personnel rotation once every 28 days. This year in April she was in dry dock for her annual refit. I won't detail everything here, but if you are interested, you can read the outline of work here. That's the feature for the week. Enjoy your weekend everyone! Images were my own this week. The Ann Harvey sailing out of the Narrows.